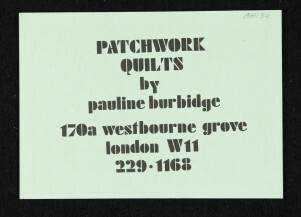 Pauline Burbidge was born in 1950 in Melbury Osmond, Dorset. 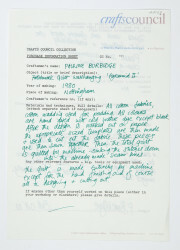 In 1969, at the age of seventeen, Burbidge enrolled at Yeovil Technical College to study art and design. After two years at Yeovil, she was accepted into a three year fashion course at London College of Fashion. After one year at LCF, Burbidge found that the school did not have enough emphasis on the creative aspect of textile work and decided apply to another course. 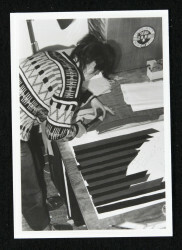 She then applied and was accepted into a three year course, from 1970-1973, at Saint Martins School of Art and received her advanced diploma in Fashion and Textiles. 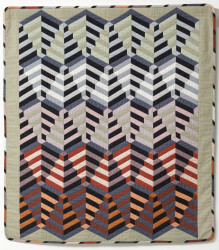 Two years later, she attended an exhibition of antique quilts and was inspired to mix quilting with her art school practice of drawing, colour, line, and abstraction. Based in London, Burbidge did a series of commissioned works for customers around the world. 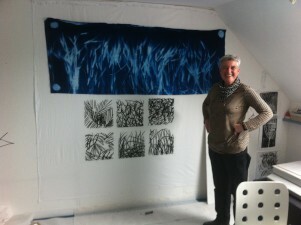 She then moved to Brighton and first made contact with the Crafts Council. Initially she reached out to the organisation to meet other textile workers in the area and then in 1978 she received a New Craftsman's Grant and a Setting Up Grant from the Council. In 1979, she became a founding member of ‘The Quilters Guild’ and from 1980-2003 she gave workshops around the United Kingdom and internationally. Her work has gone through a series of stylistic shifts over the decades, from hard edged geometry to design inspired by nature. 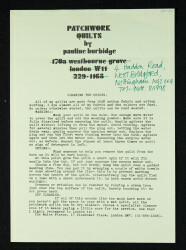 Burbidge continues to make commissioned quilts and exhibits around the United Kingdom. 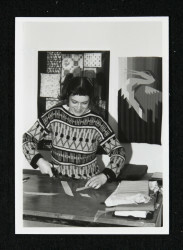 photo: Pauline Burbidge working on a patchwork quilt, photographer unknown, 1981, Crafts Council Collection: AM130.